If you would like to attend a really good Burns Supper in London you need look no further than our Birthday Festival Dinner. We celebrate the life and works of Scotland's National Bard with a good meal and a programme of toasts, poetry, songs and ceilidh dancing to live music. For details on the next supper see the Events page. In addition, our club events celebrate all aspects of Scottish culture. They are always entertaining and include some excellent live music as well as the poetry of Robert Burns and other Scottish poets, talks on a wide range of subjects and an opportunity to socialise while enjoying some refreshments. Please visit our Events page for details of past and future events. The Burns Club of London was founded in 1868 and has played an important part in the cultural life of many London Scots, and many non-Scots, since then. 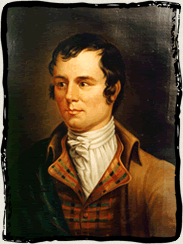 We are proud to be number 1 on the roll of The Robert Burns World Federation.